PDC Connect - Coming Soon! A new Member Directory that’s more user-friendly and has handy messaging capabilities with Contacts. A new Open Forum discussion tool that’s an upgrade from the Listserv and enables members to easily post questions across the entire membership, see timely responses and search for archived posts and responses. New online Local Group “communities” to expand local connecting and local-specific sharing and to provide a handy calendar of local meetings/events. Many Committees of the Board will also have their own online “communities” with a committee-specific discussion tool and a calendar of meetings. Improved access to conference materials and webinar recordings — easily browsable and fully searchable. Improved “search” function with expanded reach that includes discussion posts and responses, conference and webinar resources and more. Improved social media connection tool for members to share their social media links, education and job history, and to easily import profile information from LinkedIn. A new Contacts tool for easy communicating with members, similar to LinkedIn connections and Facebook friends. 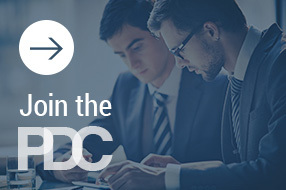 New networking resources including automatic placement of each member into three online “networks" of PDC members for easy connecting — all PDCers in your state, all PDCers in your city, and all PDCers in your firm. Watch your email for the launch announcement soon!